This recipe is the result of trying to make my keto bagel dough into keto crackers. 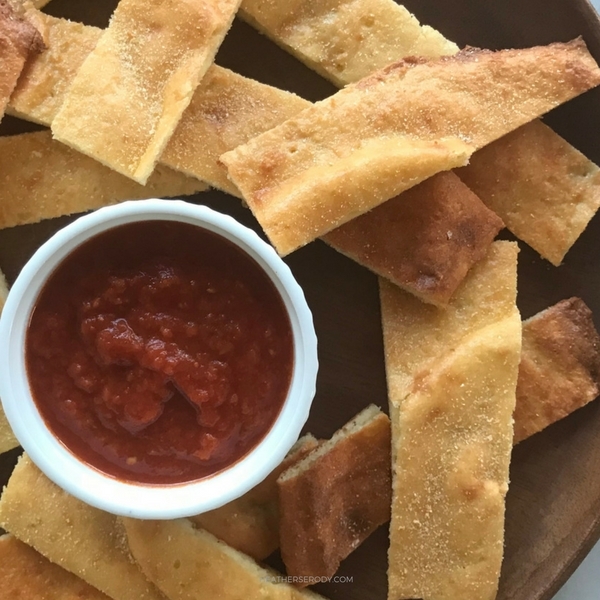 The result wasn't crackers at all, but delicious breadsticks! I just spread out the dough like a rectangular pizza crust on a parchment-lined baking sheet, & sprinkled it with garlic powder. After it comes out of the oven just let it cool for a few minutes and then cut it into breadsticks with a pizza cutter. I experimented with the basic fathead pizza dough recipe in order to create this recipe because I have always found that low-carb dough to be the closest in taste and texture to traditionally made dough. I also always try to reduce my reliance on almond flour because the carbs in almond flour quickly add up. The solution was to reduce the almond flour and combine it with pork rind breadcrumbs and grated parmesan cheese which adds a savory flavor and depth while imparting a chewy texture to the baked dough. 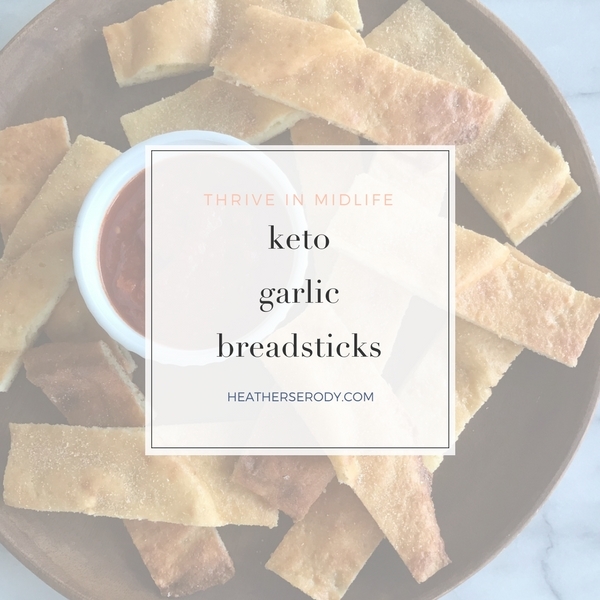 It's important to mention here that if you are trying to lose weight, you should stay away from consuming keto baked goods made with almond or coconut flour because even these low carb ‘flours' can raise blood sugar which will obstruct weight loss. My advice is always to test your blood sugar to see if consuming almond or nut flours spike your blood sugar. If so, my advice is to enjoy these treats only while your goal is to maintain your weight. You can hand-knead the dough if you don't have a food processor, just be sure to work the dough together enough that all the ingredients are well-combined. If the dough cools too much, you can reheat it in the microwave for 20-30 seconds. To make pork rind dust yourself, place a bag of natural unflavored pork rinds into the food processor and process for about 20-30 seconds, or until it resembles the texture of fine breadcrumbs. Pork rind breadcrumbs can be stored, tightly covered in the pantry for about 2 weeks. Preheat oven to 400ºF/200ºC and line a baking sheet with parchment paper. In a medium-sized glass bowl, whisk together the almond flour, pork breadcrumbs, grated parmesan, and baking powder until well-combined. Pour the flour mixture into the bowl of a food processor fitted with the steel blade. Add the mozzarella and cream cheese to the same bowl you just used. Microwave on high for 40 seconds. Stir with a spatula and return to the microwave and heat for an additional 40 seconds or until the cheese mixture is melted. Stir again with a spatula until well combined, then scrape melted cheese mixture into the food processor. Add two eggs to the rest of the ingredients in the food processor, cover, and process for 20-30 seconds, or until completely combined. The dough should be sticky but with no lumps. Oil your hands lightly with avocado oil, this will keep the dough from sticking to your hands. Turn the dough out onto the parchment lined baking sheet and lightly flatten it into a rectangular shape. Cover the dough with another sheet of parchment paper. Spread out the dough further by running a rolling pin on top of the parchment until it is about 1/4-1/2" thick. Try to get the dough as uniformly thin as possible, but don't make yourself crazy. (The dough will be too sticky to roll it directly.) Carefully and slowly peel the top parchment paper off the dough. Sprinkle with garlic powder and place in the oven to cook about 10-15 minutes, or until the dough is browned on the edges and slightly puffed in the middle. Allow the dough to cool for about 5 minutes before cutting it into breadsticks with a pizza cutter. 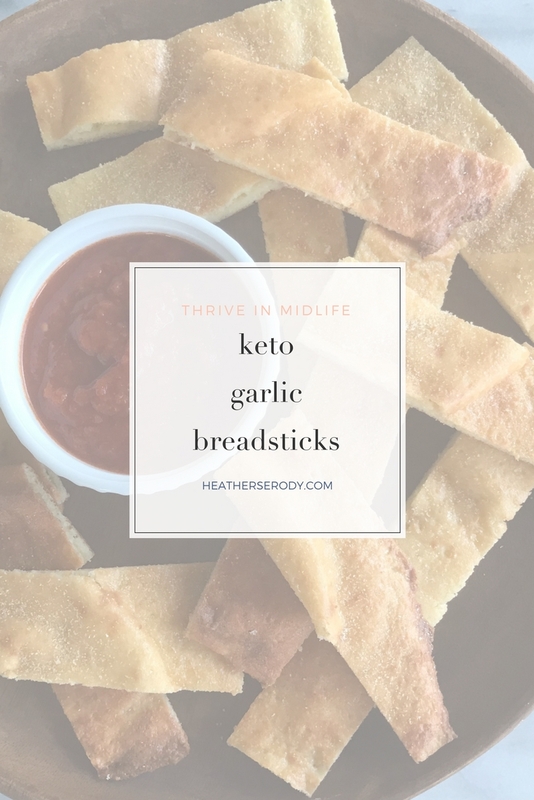 Serve warm with your favorite warmed marinara sauce to dip or serve with your favorite keto soup or salad. *To make pork rind dust yourself, place a bag of natural unflavored pork rinds into the food processor and process for about 20-30 seconds, or until it resembles the texture of fine breadcrumbs. Pork rind breadcrumbs can be stored, tightly covered in the pantry for about 2 weeks.